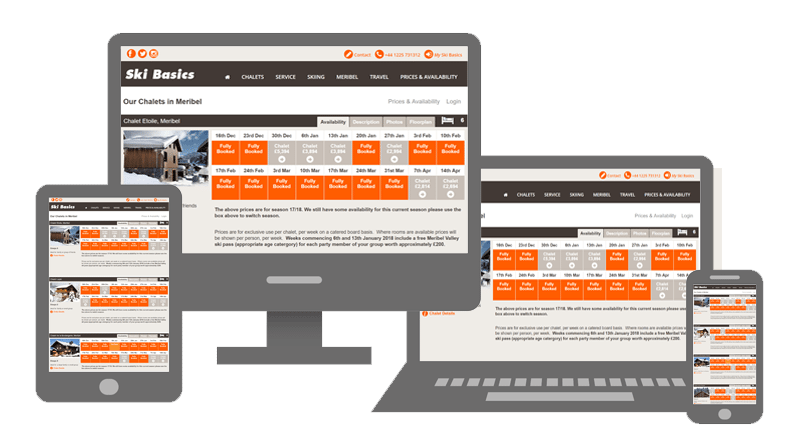 How does myChaletBooking chalet booking system work? My Chalet Booking makes running your ski chalet business much easier. It’s an online booking system that will free you from admin; saving you time so you can concentrate on your customers and enjoy the slopes. Allows customers to manage their booking, adding notes regarding their holiday i.e. allergies etc. Create notes on clients only visible from back end to managers etc. myChaletBooking integrates perfectly with your website putting your online brochure to work by taking bookings, payments & talking to customers – without any loss of control or commissions to pay. You can promote chalets from within the booking system. Advertise availability, attach branded brochures, photos & floor plans. One glance is all it takes! With just one glance you can see exactly where each booking is in terms of payment & confirmation. You can manage each booking from one central place, send individual emails and share information with your team. All standard communication tools can be set up, personalised & automatically sent when required. Accounts are instantly created giving you direct access to party members, tranfers, extras, invoices & emails. Offer more & remember less. myChaletBooking let’s you offer more… automatically prompting customers to buy ski passes & save money in the process. No need to remember who requested what, it’s all recorded for you. Generate reports on payments; upcoming transfers & ski passes at the click of a button. Check financial performance, occupancy and see which chalets are performing best. Customers browse your chalets (either on your website or myChaletBooking) and can book at anytime, anyplace, anywhere. You can provide real-time availability, chalet details, photographs, descriptions & floorplans. All information can be easily refreshed at anytime. It is easy for customers to hold a chalet (take an ‘option’), giving them time to talk to party members and make the final decision. myChaletBooking will automatically reserve the chalet and help you keep in touch until the booking is confirmed. Your customers have options & you have peace of mind. Convenient & secure for all. myChaletBooking provides a personal account for your customers to take payments & relevant customer information. Customers receive automated invoices, payment reminders & payment confirmations. Based in the cloud, payments can be taken at your customers convienence 24/7, whilst you are sleeping or on the slopes! Your customers have control over their booking information. From spelling their name correctly, to ensuring their transfer time is correct, it’s all available from within their account. You’re both in control, with the full picture & peace of mind for all. Customers pay securely online, (offline too) & receive invoices & booking confirmations at the appropriate times. Credit card surcharges are added automatically. You get paid the right amount at the right time, and at your customers convience. 6/6 – Pre-order, promote & upsell extras! myChaletBooking makes it easy for customers to buy extras. Complicated Ski Passes can be ordered & paid for, & organised instantaneously. You can offer transfers paid-for or special requests. It’s all possible with myChaletBooking. 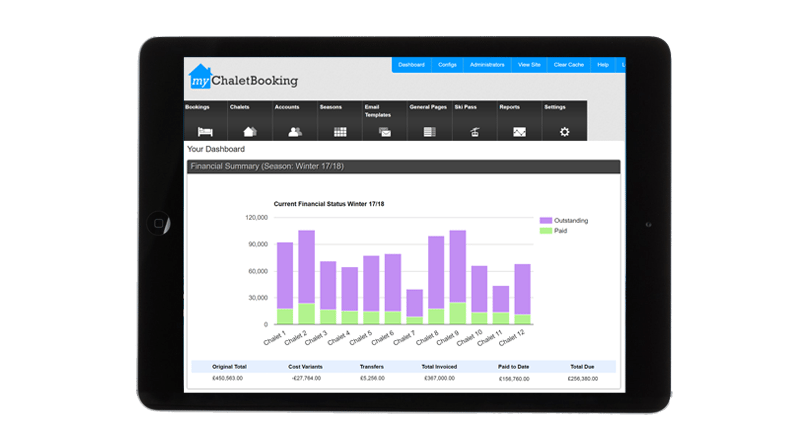 myChaletBooking is the first of its kind booking management system tailored specifically to chalet owners.